Tires lose pressure over time, so check the pressure on all four of your tires once a month. The label located on the edge of the driver’s door will tell you what tire pressure the manufacturer recommends for your car or truck. By keeping your tires at their recommended pressure, they’ll last longer, they’ll improve your gas mileage by up to 3 percent, and you’ll be safer on the road. Check the air filter in your vehicle and replace it regularly. Clogged air filters impact your vehicle’s acceleration. If your “check engine” light is on, get your vehicle checked out as soon as possible. By keeping your engine tuned, you can reduce emissions, as well as help increase gas mileage. Driving a vehicle that is in need of maintenance or repair can increase emissions and cost you $540 more in gas each year. By following the manufacturer’s suggested maintenance schedule and using the recommended grade of motor oil for your vehicle, you can improve fuel economy. You save money by improving your vehicle’s performance and extending its life, while also reducing emissions. * Based on driving 15,000 miles per year at 25 miles per gallon. Over 60,800 tons of tires were sent to Texas landfills last year! Reduce the number of tires you use by taking care of the ones you have. Test your tire tread monthly using the ‘penny test’. Insert a penny upside down. If you can see the top of Lincoln’s head, the tread is too low. When you can no longer use the tires, make sure to dispose of them properly. Visit Earth911.com to find a recycling center near you. Refuel in the late afternoon and evening, which reduces the likelihood of ground-level ozone formation. When filling your vehicle’s gas tank, don’t top it off, which can allow fuel to escape as vapor and also increases the chance for spilling gas. After you finish filling up, make sure you properly tighten the gas cap; otherwise, gas will evaporate from your car’s tank. Idling can use a quarter to a half gallon of fuel per hour, depending on engine size and air conditioner use. If you expect to idle for more than 30 seconds, park your vehicle, turn it off, and go inside. Whether you’re at a restaurant, at a bank, or anywhere else you might wait in line, avoid unnecessary idling by parking and turning off your vehicle. You’ll dramatically reduce your fuel costs and help keep the air clean. It only takes one gallon of recycled oil, versus 42 gallons of crude oil, to produce 2.5 quarts of motor oil. Whenever you change your oil or other vehicle fluids at home, make sure you recycle them. And never pour used motor oil down storm drains, because the drains will carry the oil directly to Texas waterways. The used oil from one oil change can contaminate 1 million gallons of fresh water. Find a recycling center near you. In some communities, the TCEQ offers assistance for individuals who need to repair or replace older vehicles. To help replace older, more polluting vehicles from Texas roadways in counties with high ground-level ozone, and reduce emissions from vehicles that are already on the road, the TCEQ offers help to replace and repair vehicles through the AirCheckTexas Drive a Clean Machine Program. 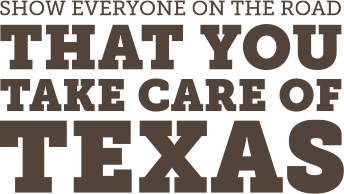 Eligible individuals in 16 Texas counties can receive financial assistance to replace vehicles that are more than 10 years old, or to help repair vehicles that have failed an emissions test. Visit www.driveacleanmachine.org to find out more about how you might qualify.